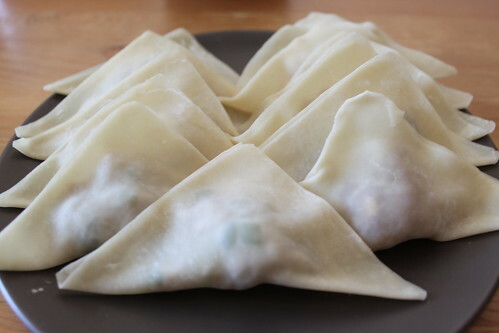 Wonton is one of the popular dishes among the Chinese community. There are many ways to prepare wonton. You can boil in a soup or deep fry the wonton. My husband behaves like a typical child who doesn't like to take some vegetable such as leek and green onion. In order to encourage him to eat this type of vegetable, I have to make the dish into more appetizing such as mixing the minced meat/prawn with small pieces of green onion, carrot or leek in the wonton wraps. Fried wonton is his favourite dish and in the end, it really works. I hope this method would help the mothers to enhance their creativity with colour, taste and shapes when preparing meals for their children. Fried Wonton ready to be served. Mix minced meat with all of the marinated sauce in a bowl. Then, add in small pieces of green onion and carrots and combine them well with the minced meat. Leave to marinate for 30 minutes. Take one wonton skin and lay on your palm. Make sure that your hand is dry before holding the wonton skin. 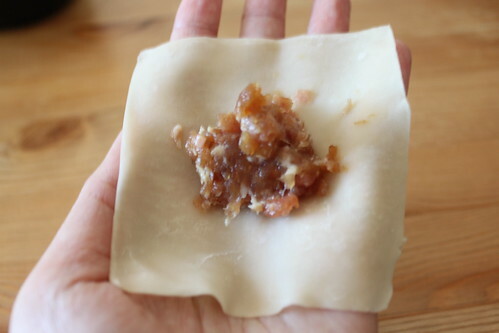 Take 1 teaspoon of the mixture (minced meat+green onion+carrots) and place it in the middle of the wonton skin. Look at the picture below. 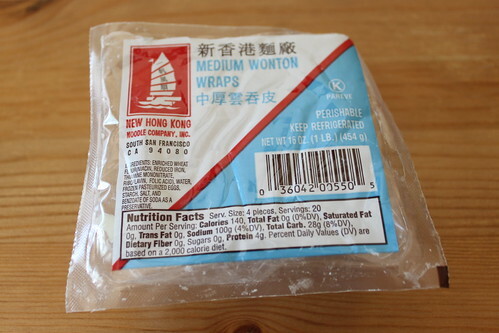 wonton wrap is in triangular shape after the folding process. 5. Repeat the process from no. 2 to no. 5 for the remaining wonton wraps. fill the pan about half of your thumb with cooking oil. 7. When the cooking oil becomes hot in the pan, turn from high heat to medium heat (medium fire). 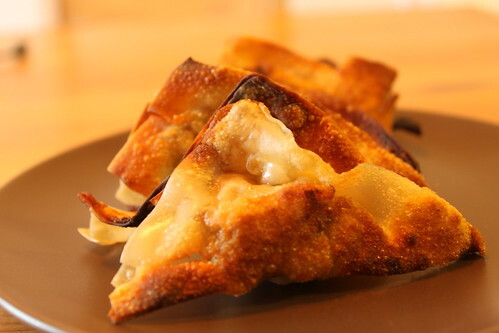 fry both sides of wonton wraps into golden brown. 8. Remove and drain the fried wonton on paper towel before ready to dish out.